I grew up on a small family farm in rural Missouri. My world was pretty small … a trip to St Joseph, 32 miles away, was a very big deal. I joined Scouting while in second grade, and loved reading Boy’s Life and dreaming big dreams about what I would do in Scouting. One of my biggest dreams was to go on the ultimate Scouting adventure: backpacking at tbe Philmont Scout Reservation, near Cimarron, New Mexico. 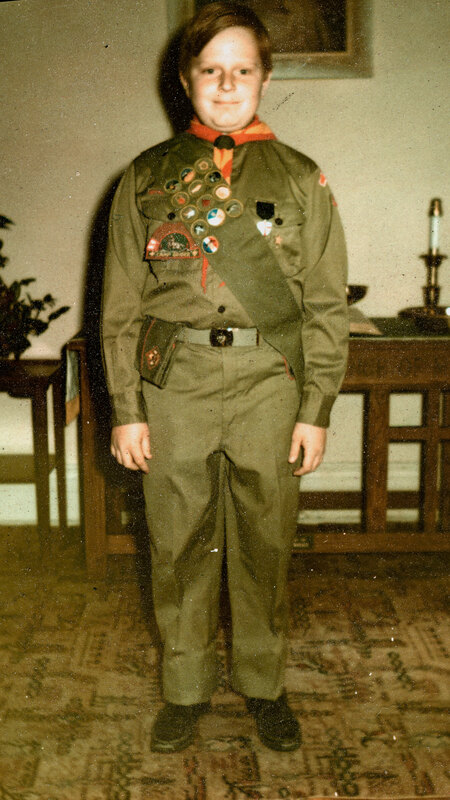 Understand, my Troop never went backpacking. Such a trip was way, way beyond the resources of my family, and of my troop. It simply wasn’t going to happen. But the dream … did not die. 1970, after receiving my God & Country award. I was 14 years old, and wouldn’t have lasted on the trails of Philmont, even if I could have gotten there. It’s important to have goals. Really, really big goals. You need to get big ones. I wrote in a recent post about “The 2012 Plan.” This plan took 15 years to complete, and the best part was that I didn’t have to do the work! I graduated from Mizzou in 1978. Beginning in 1997, it was up to the wife and 3 kids for them to earn their degrees. 15 years and 5 degrees later, we deserve the family celebration that’s just a few days away. I’m sure that Velda will say that the worst part of the Plan was that the family had to eat my cooking while she was studying for her Masters in Nursing from UCLA. I never understood what the problem was: not only am I proficient in the kitchen, I prepare dishes that Velda never will. And the kids didn’t complain (too much) about the 3 dishes they said I prepared … not even the Hamburger Helper! Good news: we all survived! No one will mistake what I do for the artistry that Velda performs in the kitchen. But the choice to miss her cooking for a few meals in order for her to achieve one of her big goals was not a choice at all. She’s been happy as a nurse practitioner ever since. But, back to Philmont. I did not reach that goal until I was 46. But that’s really not the story. 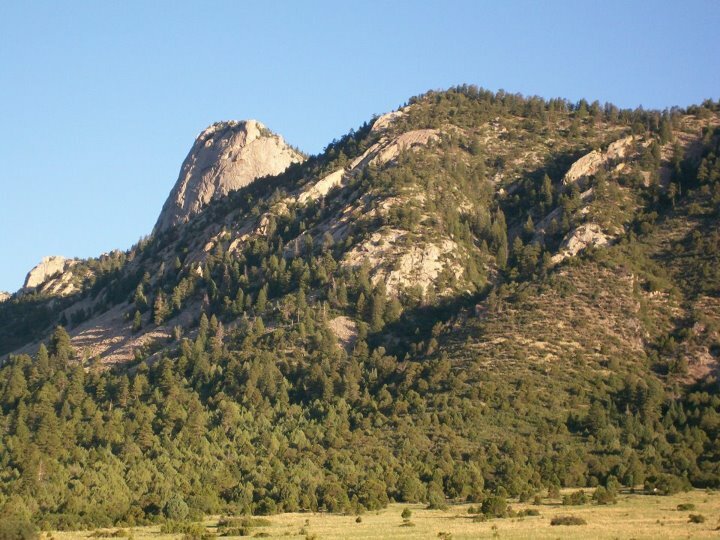 Climbing the Tooth of Time is a part of the Philmont experience that no backpacker should miss! The problem for me was that Boy Scouts are serious about backpacking, and, thank goodness, they expect the boys and leaders to be in shape. You have to make a goal weight based on your height … or you don’t go on the trail. Once I understood that my boys wanted to go to Philmont, I had to prepare myself. And lose about 60 pounds. I’ve never been a gym rat. Velda had achieved great success with Weight Watchers, but that didn’t seem like my thing, either. I started doing what I had not done since high school: I decided to run. The problem, though, was that I wasn’t able to run any distance at all. I started walking in my cross trainer Reeboks, wearing sweats … and worked myself up from there. Eventually, I could run 2 miles without walking. That was a very big day, let me assure you! But I was not nearly done. I fixed my diet (a calorie-counting shake from Costco in the morning, a banana and an apple for snacks, Subway for lunch, and a sensible dinner from Velda. I kept pushing. And the weight fell off. Running became a daily obsession, and I eventually got up to 7-mile runs on the weekends. I faithfully kept a running log every day, and used a GPS system to track my times for each segment of the runs I did. 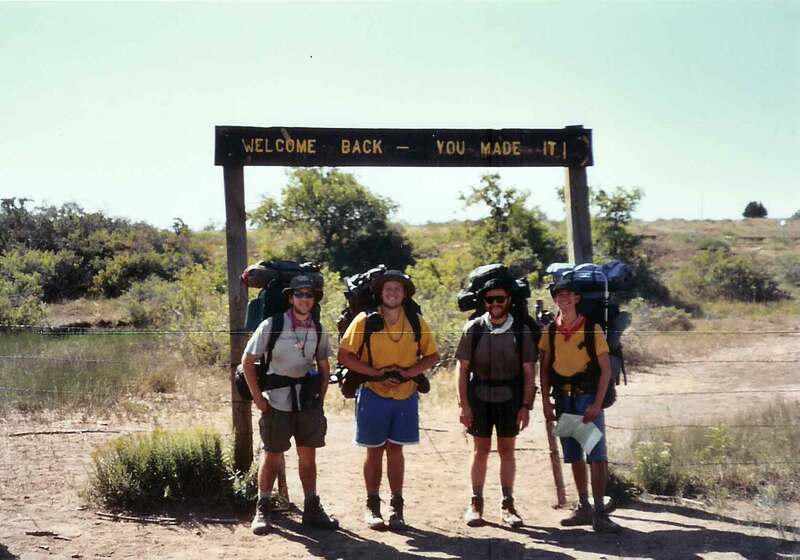 By the time I went to Philmont with my boys, I was in the best shape of my life. I had lost 70 pounds. Hitting the trail with 50+ pounds on my back for a 10-day, 52-mile trek was still nothing to sneeze at, but I was ready. I was 46, but keeping up with 17-year old boys was not a problem. We sat on the Tooth of Time at sunrise, and we proudly proclaimed “Go Big or Go Home” while we reveled in the burro races, the trail food, and a feeling of self reliance that’s very difficult to discover if you’re sitting on your sofa. It was the most personally fulfilling thing I have done in Scouting. And I got there because I had a goal. A big one. We made it: Michael Mowry, Christopher Mowry, myself, and Lyle “The Destroyer” Wohlfarth with the map he was in charge of for all 52 miles. 2003.